Well, this is it. The moment you avid readers were praying would never arrive yet in your hearts knew was creeping up, inevitable as that scrape of metal on cardboardy substance as the spoon comes away empty and you realize that, alas…there really IS no more Ice cream left in the tub. Same situation here really. It would be great to keep going but we’ve reached the bottom of the barrel, migration has slowed to a mere trickle….You know, it was a a barrel of laughs a week ago… like shooting fish in a barrel and we were happy as a barrel of monkeys…laughing…shooting fish, whatever. But now, as the great poet and song-writer Jim Morrison so lyrically put it; this is the end. So, with one last census on the cards I arrived at the station this morning to find…hey, where’d the water go??? For the last 4 days it had been up to net 1 and suddenly it was gone. From by the banding lab I could just make out some water starting by net 13 (the second net….). Amazingly, I could do a complete net round (with rubber boots)! I guess that the river had dropped below that critical point where it was flooding into the fields and across into those nets that are not along the river bank (our nets are in an “L” shape. There are 6 nets between the banding lab and the river then to the right, following the river are another 5 nets, there is also one net just the other side of the river). Anyways, assuming that the situation would not have changed, I had arrived at the station at census time, so I did not end up having the time to do any actual banding. Census was, as expected, slow. 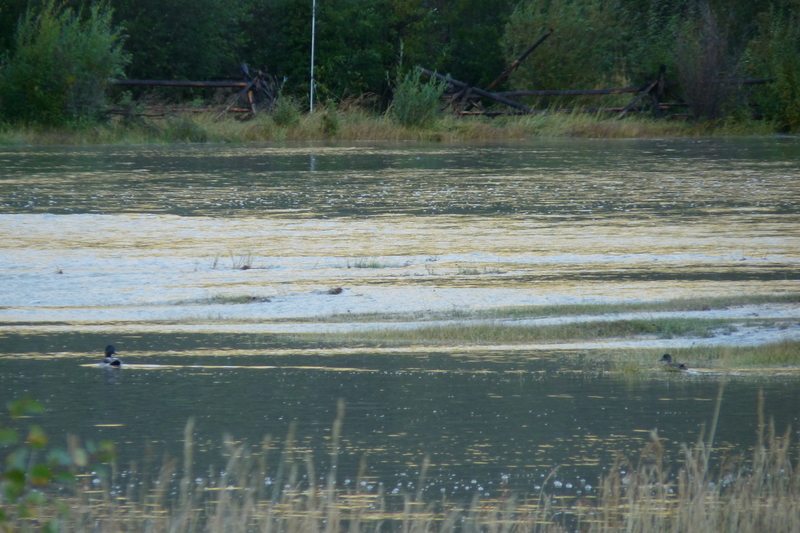 Despite the reduced size of the “lake” in the field, the number of waterfowl had double. 48 Mallard, 16 Green-winged Teal, 14 Northern Pintail and 3 American Wigeon. A Ring-necked Duck flew over low, but thought “too shallow for diving” and kept going. The Northern Pygmy-owl was calling again from the other side of the lake. I had thought I heard him the other day but over the roar of the river, I wasn’t sure. About halfway through census an unfamiliar call caught my ears from overheard – a rolling vr-d-lee?, despite hearing it twice more and frantically searching the skies overhead, I could not see it’s maker. Despite listening to calls of numerous birds on the internet, I have not been able to ID it. The nearest thing so far has been Snow Bunting, which was one of my prime suspects. A final scan of the lake and the surrounding visible area produced one final bird for the census, an unexpected imm. Greater White-fronted Goose, loafing by the mouth of the river. One last hurrah indeed! As I could get to pretty much all the nets I spent the rest of the morning and early afternoon taking down nets and stowing net poles in the rafters of the banding lab. A flock of 17 (my lucky number) Red Crossbills flew over and the Clark’s Nutcrackers screeched their final farewells. A successful season? I think so! The second to last day of the season. Tomorrow I will complete the final census of this successful fall. Yes, I would still say successful, despite the past few days. Up to the 24th we were on track to smash the TLBO season banded record and break 2000 for the first time. However, twas not meant to be. This morning there was no noticeable change in the water levels, so after a quick look at the lake where there was a large flock of Mallards with a few Northern Pintails and a lone Northern Shoveler, I took off on census. It was relatively quiet with low numbers of birds about. A very uniform Cassin’s Vireo got my blood pressure up – I was thinking Hutton’s Vireo, a coastal species, until I saw it’s distinct white Spectacles. Interestingly though this bird lacked all but the faintest hint of a grey head and yellow flanks. Otherwise very olive overall. It’s namesake Cassin’s Finch was also seen, a presumed immature male (female-like in plumage) was giving snatches of song from atop a snag. No raptor movement noted today and 4 dark specks out on the lake may have been Scoters, otherwise I can’t say that I have much else to report. Hi folks, as Avery has mentioned, I am stuck down in Bella Coola indefinitely. It doesn’t look like I’m missing out on much up thereand with only two days left in the regular season schedule, I’m not sure I’ll band another bird in 2010. The highway between here and Tatlayoko could be closed for up to two months, so the only way out of here is via a ferry to Vancouver Island or Prince Rupert. Once that happens, I’ll be able to drive back around. There is some info and photos/video are available on my personal website: http://www.steveogle.ca, on the blog page. Like you, I’ll be continuing to follow the TLBO blog to see if Avery can get things back up and running! Go man! Some minor flooding. 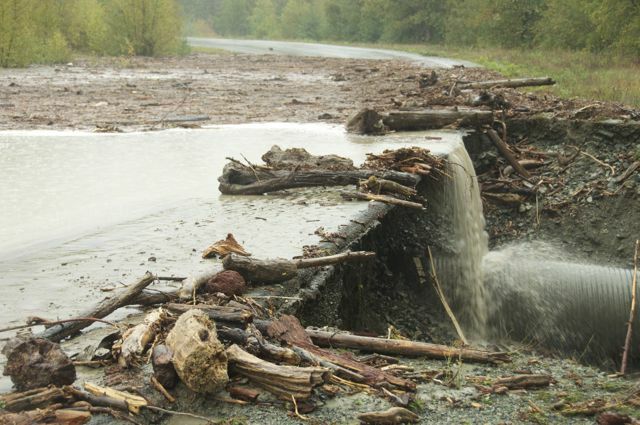 In some areas, more than 1km of highway is washed away. So nothing has changed down at the station. It rained for about 10 hours yesterday which probably didn’t help. I did manage to catch a lone Ruby-crowned Kinglet in net 1 which I opened for a half hour when a flock of “RCKIs” were flitting about in that area. As if to compensate for the lack of netability, good birds continue to show up. 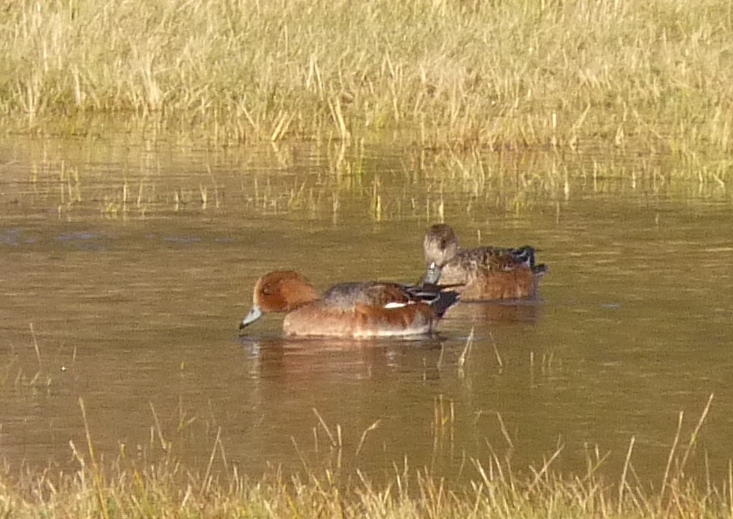 This morning’s new bird for the TLBO list was a drake Eurasian Wigeon. It was associating with a baker’s dozen of American Wigeons, a handful of Northern Pintails and a pinch of Northern Shoveler. They were stewing about on the new lake-in-the-field. There were at least 6 Sharp-shinnied Hawks around a 2 Merlins along with a dark phase Red-tailed Hawk. It’s a treacherous world for a songbird. Still flooded out up here. The good news today was that I could walk as far as our second net, a 20m advance on yesterday! Woohooooo, now only 400 metres of water to go to the usual river bank. It was incredibly windy this morning so census was fairly unproductive. There are still lots of Yellow-rumped Warblers pushing through and Golden-crowned Kinglets seem to be becoming more frequent. The only high point of the morning was another new bird for the TLBO list, and immature Surf Scoter on the lake! It’s beginning to look as if there will be no more banding this season but I am still holding out hope that I will at least be able to open a few nets, possibly tomorrow, but more likely wednesday. The latest word from Steve in Bella Coola is that it could take up to 2 months to repair the highway so he will have to take a ferry to Port Hardy and drive all the way around to here to retrieve his stuff! Well, nature has been doing it’s damnedest to make sure that we don’t break 2000 birds for the season. As some of you may have heard or seen on the news, this area has been hit hard by some very heavy rain over the last couple days. 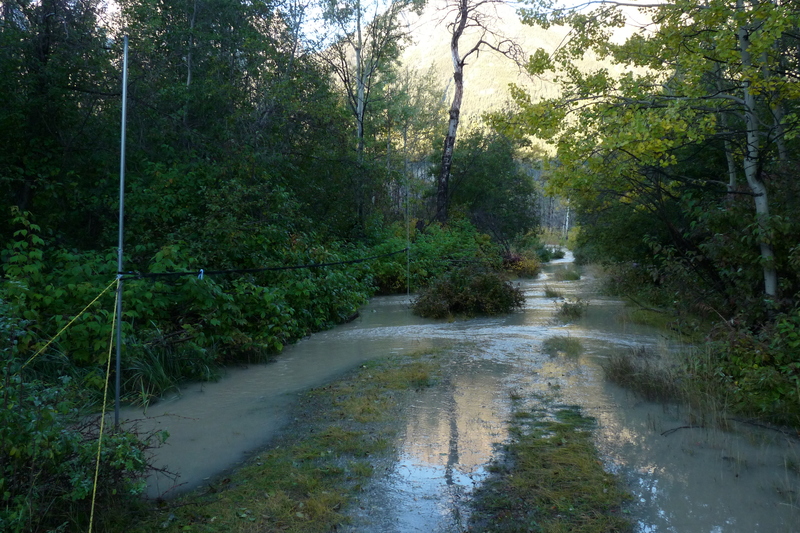 However, what Bella Coola has been experiencing makes our deluge here seem like a spring shower. Lucky Steve set off friday morning for an over-nighter in Bella Coola. Though the forecast called for near continuous rain friday and saturday I don’t think anyone expected the following to happen. 210mm Of rain fell friday and saturday causing the river to rise an incredible 4 metres in 12 hours! This is the biggest flood in recorded history in Bella Coola. Word around here has it that there are 4 bridges washed out between Steve and the Bird Observatory, so who knows when he’ll make it back here. However, it’s not all bad; Steve did catch a couple Cohos and he got some stellar video footage, look for it on Global news tonight! Getting back to our little flood here. This morning was bright and clear with no wind and I was anticipating a good morning, which usually follows strong weather. An immature Northern Goshawk that allowed me to watch it from 5 metre was a good omen, or so I thought. However, I should have realized something was amiss when a herd of cattle migrating north (away from the lake) passed me by the gate to the Bird Observatory. Unfortunately, I guess our own river here, the Homathko, has risen by close to 2m causing flooding right up net 1, right outside the banding lab! What was once field on the way back from net 17 is now a large lake, that even had a Mallard and an American Wigeon swimming about on it. Even with rubber boots I could only get to 2 of our 12 nets, and those had 10 inches of water under them. Nor could I do a proper census as that route to was flooded as well. So I guess there comes a point when you just have to sit back and let nature run it’s course. I don’t think I will be able to band tomorrow and we’ll see how things are looking tuesday. No banding this morning. It was raining when I woke up and it is raining still at 4:30pm. Phil Ransen and I went down to the station around census time and while he did census I hung around doing odd jobs waiting to see if the weather would improve. Just bout the only bird observation worth noting was a probable Greater White-fronted Goose flying with 2 Canadas. Unfortunately neither Phil nor I got good enough looks to confirm this. Tomorrow is supposed to be better weather so hopefully we can get some nets open. We are going to have to push hard to break 2000 birds banded for the season, for the first time in the short history of TLBO. We currently stand at 1816 so this milestone is within reach, methinks.